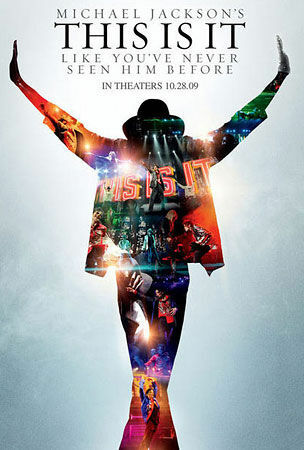 Last night I got the chance to see the new Michael Jackson movie, This Is It. I was excited to see one of my favorite live performers of all time, one more time. I went into the movie without reading any of the reviews so I could make my own judgement on the show. I didn’t really know what to expect other than seeing Michael rehearsing for the tour that he had planned at the time of his passing. This Is It really is a behind the scenes look at the tour preparations and rehearsal for his O2 tour which was hoped to be a momentous comeback for him. The film starts with interviews of excited dancers who had made it through the tough audition process to be able to be onstage with the King Of Pop. The movie switches Michael footage very quickly which is good, that’s who I wanted to see! There are bits of rehearsal and preparation scenes cut between full song performances. It’s very insightful to see how involved Michael was with every aspect of the show. I particularly liked his interaction with the incredible band he had assembled. Michael knew what he wanted to hear coming from the musicians and he would push them until they were able to do what he was hearing in his head. There are also very good scenes where Michael is working on various parts of the dance choreography and stage production. I was touched by how nice Michael was to everyone he was working with. He is obviously the whole reason for everything that is going on and he’s very much in charge but he’s gentle with the people he’s working with. In one scene he tells his band “I should be conserving my voice, I’m warming up my instrument” as they cheer him on to give his full performance. Granted we may only be seeing the side of Michael his estate wants us to see in the movie, but the moments seemed genuine. Here’s the kicker, the guy could still flat-out perform!! The movie is tinged with sadness because you know he will not live to see this tour become a reality. From what I saw, the visuals were simply stunning. The new tour animations and song updates are full of energy and would have simply been incredible to see live. The new Thriller footage supercharges the original music video and Smooth Criminal has a very fun mini-movie as well. If Michael would have lived and completed this tour, I’m sure it would have been the comeback he was hoping for. Another thing that will move you to sadness is all the times you will say to yourself “if”. Such as “If he would have lived”, “If the tour would have happened”, “If he could have brought this to America”. After seeing how vibrant and alive Michael is during these rehearsals I got very upset at how he died. Michael looks so great when he’s dancing it’s hard to believe he was 50 years old. He was a gifted dancer for sure and his moves were just as fluid and smooth as they ever were. Michael’s voice is in fine form for the most part as well. Every singer loses some power as they age but they pick up expression. This is evident as well in “This Is It”. Micheal sings with great emotion even when his voice isn’t at maximum power. I was very surprised with how well his singing and dancing were after all the news stories about his poor health over the years. Other than the bad plastic surgery to his face, Micheal Jackson looks and sounds fantastic in this movie. Now, in fairness I’m sure there is some Hollywood magic taking place in the audio production and the camera is very friendly to Michael with good shots chosen for every scene. But the greatness of Michael’s performance is still there and it’s undeniable. Does “This Is It” skim over all Michael’s reported personal problems? Yes it probably does. But do you really want to rehash them again? I was happy just to watch Michael in his element which is him commanding from the stage. It’s too bad that he seemed to forget in his later years that the stage is where he belonged. I guess everyone hates their job sometimes even when they’re the best at it. High points of the movie for me were the interplay between his two excellent guitarists, the beautiful Orianthi Panagaris (I think I have a crush on her) who simply rocks like crazy on songs like “Beat It” and “Black Or White” and Thomas Organ who plays some truly righteous guitar. There’s a great scene where the two guitarists are soloing at the same time, center stage and it’s just killer! The whole band was excellent, and again it’s sad that the world didn’t get to hear them perform. There’s also a great scene where a cute little girl gets chased through a rain forest by a huge bulldozer. The song is called “Earth Song” and at the end the bulldozer ends up onstage with Michael Jackson. It’s really a great sequence. If you’re a fan of Michael Jackson you should definitely see the show. Even if you were just a fan in 80’s you will enjoy the show. If you’re not familiar with Michael Jackson but you are a musician, you will enjoy the show. If you’re just a casual music listener unfamiliar with Michael and his music, the movie may get boring. So for all you musicians out there, go see it with other musicians!